An understanding of these particles' structures provides crucial insights about the forces that hold matter together and enables researchers to apply this knowledge to other scientific problems. Although electrons have been relatively straightforward to study, protons and neutrons have proved more challenging. Protons are used in medical treatments, scattering experiments, and fusion energy, but nuclear scientists have struggled to precisely measure their underlying structure—until now. "Being able to perform these calculations and precisely quantify the interactions among the particles in a proton is essential to gaining a better understanding of the proton and a better understanding of lattice QCD as a whole," Alexandrou said. "For example, if we find something new from these types of calculations that is not shown in experiment, we might need to reevaluate our theoretical concepts. That would be a significant finding, of course." "Titan was perfect for us because of its hybrid architecture," Alexandrou said. "We would not have managed to do this calculation without this kind of capability." During a high-energy particle collision, an electron smashes into a proton, shaking up the proton's fundamental components and then bouncing off. The proton is made up of three elementary particles—called quarks—as well as the gluon particles that act as carriers of the "strong force" that binds the quarks tightly together like a bag of marbles. The quarks—or "partons," as they were originally termed in 1969 by physicist Richard Feynman—exchange momentum with the electron at the point of contact. 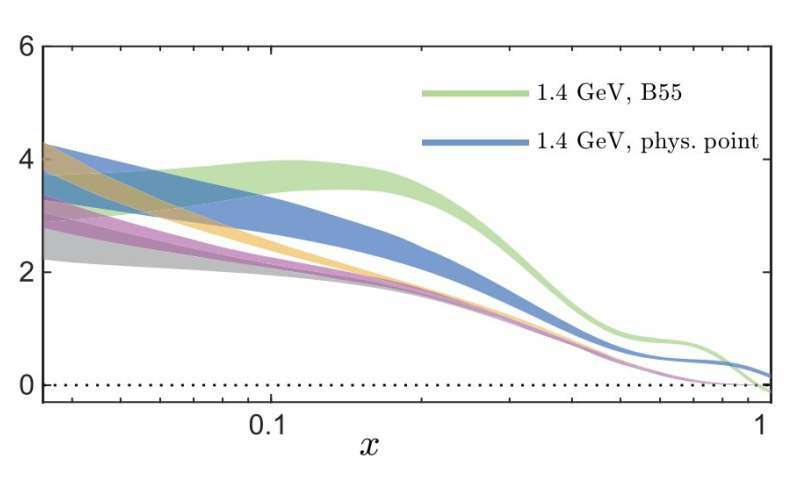 When a quark gets "knocked out of the bag," something interesting happens. Rather than revealing itself to the observer, the quark is immediately paired with an antiquark created from the vacuum of space, rendering the particle colorless, meaning it cannot be observed. Scientists, however, can use lattice QCD calculations to find out where the parton may be—and from where it may have come. "Studying the properties of protons is difficult because you cannot break them up and study them," Alexandrou said, explaining that the strong force binds quarks so tightly within a proton that scientists must study the interior interactions to gain new insights. "Any composite system in nature, up until now, we could break. But we can never, ever break the proton, so we have to study the particles inside it." "It's incredible how many more calculations we are able to do with Titan," Alexandrou said. "We need even more calculations before we can begin doing simulations that are more accurate than experiment. And the ultimate goal is to find out something we don't yet know." The team has been running simulations on bigger lattices and hopes to take the project to the next level with even more momentum. A larger amount of momentum will provide more accuracy—but only if there is enough computation to properly control for errors. Performing these kinds of calculations could give scientists a comprehensive picture of the proton's structure and interactions. "Eventually, these calculations are going to be useful for guiding experimentalists," Alexandrou said. "If we have detailed information about the proton, we can tell experimentalists what to measure, what not to measure, where to look, and where not to look. And through this process, we may even discover something completely new." "The feat is significant because modeling the proton structure from lattice QCD will provide important information about how matter is held together at the subatomic scale." I have a very bad feeling about this. This is too dangerous what they are doing and are planning to do. These scientists are getting into that which should never be dealt with and found out. They don't understand the consequences if they go further into it. Some things are best left alone.